I thought I’d be testing carrot cupcake recipes all week, but thanks to Sue and The Silver Palate Cookbook, the search is over. Sorry in advance to Todd’s coworkers who have been enjoying the carrot cake tests, but I promise I will send in some of these. They’re brownish in color rather than bright orange, sweet but not overly so, stuffed with nuts, pineapple and raisins, and strong in cinnamon and vanilla flavor with notes of browned butter. And most importantly, they’re dense and heavy, which is something I appreciate in a carrot cake. I did have to make some changes, though. The SP recipe makes a huge cake and at least 32 cupcakes, so I scaled it down to make 24 to 27. As for ingredient changes, I used a mixture of melted browned butter and oil instead of just oil, used a mixture of granulated and dark brown sugar — reducing the latter somewhat since it’s heavier than granulated and light brown, decreased the proportion of coconut so that there would be just a hint, and added an assortment of raisins. If you want to see the recipe without changes, a Google search will bring it up in an instant. But here’s how I made the cupcakes. Preheat oven to 350 degrees F. Line 24 to 27 cupcake cups with paper liners. Drain the pineapple, reserving the juice. Put the raisins in the pineapple juice to soak, then pat the rest of the pineapple as dry as possible using paper towels. Mix the dry ingredients in a large bowl. Add oil, butter, eggs, and vanilla and stir until well mixed. Stir in nuts, coconut, carrots, and your drained pineapple. Drain the raisins and add them. The batter should be really thick. Divide equally among the cupcake cups. They should be filled a little more than 3/4 full, because these don't rise very much. Bake on center rack for 20 to 24 minutes or until cupcakes are set. Let cool completely, then ice with cream cheese frosting. Cream Cheese Frosting: Beat together 8 oz softened cream cheese and 4 oz softened butter. Stir in 2-3 cups powdered sugar and beat until light, then add a teaspoon of vanilla and a dash of fresh lemon juice. Organic sugar or "evaporated cane juice crystals" has a little more flavor than regular granulated and is a darker color. I will definitely try this because I, too, enjoy a heavy, dense carrot cake. I have a great one as well. 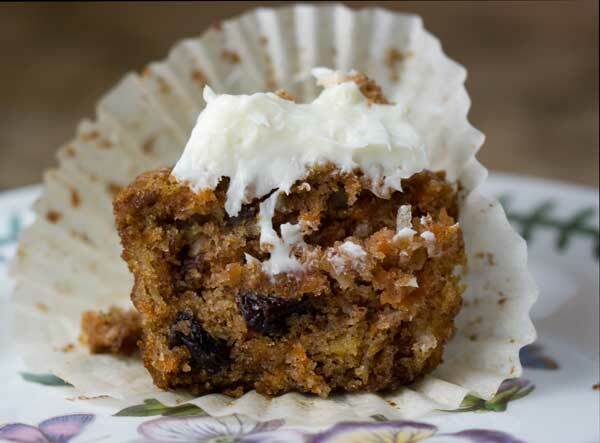 It includes dates which isn’t an ingredient commonly included in carrot cakes. My friend’s mom has been making it for over 50 years and gave me the recipe which I posted on my blog if you’re interested. Thanks, Anna. I clearly didn’t read Step 6 very well. I can’t wait to try these! Jen, I love cream cheese frosting on carrot cake. I put the one I used in step 6. I am so glad these worked out for you! I can’t wait to try your changes. The browned butter is brilliant. I’ll probably leave the coconut the same though. I just made a hummingbird cake for Scout’s tonight. But I was really craving another carrot cake (only got a sliver of my carrot cake on Easter), but I thought I’d wait till you got the perfect CC figured out before I made another. Now I’ll have to bake again tomorrow! Hooray! I mean, Poor me. I was waiting for you favorite! 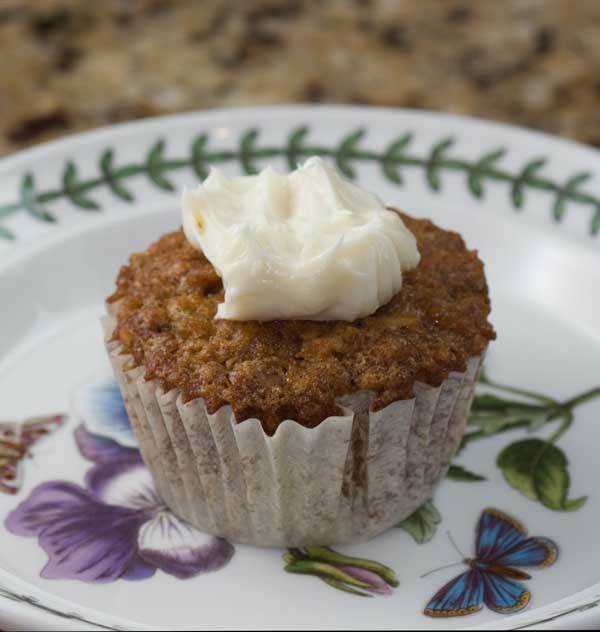 So, what’s your favorite frosting for carrot cake cupcakes? I love how you don’t seem to be putting too much frosting on any of these. I much prefer a heavier cake-to-frosting ration when it comes to carrot cake. Leah, I’ll have to look at Hummingbird’s recipe as well. Thanks!